California Pitcher Plant or the cobra lily settlements truly flourish in ultramafic soils containing an ample abundance of dark, ferromagnesian minerals. The cobra lily’s natural design allows it to enhance its requirements of nitrogen through carnivory, which goes to compensate for deficient nitrogen. It is interesting to note that all varieties catch insects and other prey without using any moving parts. They have stationary traps and consist of a combination of attractions like scent, color and nectar and inescapability. Characteristically, the inlets to the traps are one-way because of the highly adapted features already described. Most varieties employ a mishmash of drugged nectar, scent, waxy deposits, which block insect feet and gravity to bring down insects into their pitcher. Certain varieties contain coniine, an alkaloid drug that tranquilizes insects. The insect on entering the plant finds the footing very slippery because of the waxy surface of the walls of the pitcher. As the insect goes down further, downward-pointing hairs make its escape impracticable. 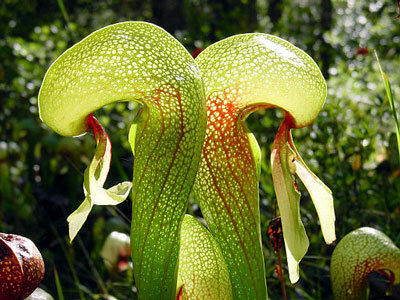 These plants have not indicated a clear presence of digesting enzymes in the fluid at the base of the pitcher. These plants probably rely on the bacteria present in the pitcher to facilitate the digestion process. Recent lab studies show that this genus secretes at least one proteolytic enzyme that helps in the digestion process. Since the Cobra Lilies enjoy the pure mountain water in their habitat of bogs and stream banks, you will get better results when you replicate these conditions in captive cultivation, with a supply of purified water as a must. Placing ice-cubes of purified water on the surface of the soil substrate on hot days is ideal for the plants. These plants flourish under reasonable humidity conditions, but can adapt ton low humidity also in an emergency. In late to middle spring, you can sometimes see a minute Cobra Lily plant at the end of a stolon. Cut these colons into a few inches long sections with a part of their roots attached. Spread these cut stolons upon the moist, cool long-fibered and shredded sphagnum moss and store in a humid location with bright light. In a few weeks, you will find cobra plants protruding from each cut section of the stolon. Persistent carnivorous plant aficionados have not only cultivated these plants with success, but also have discovered a variety of three-color morphs in fully red, fully green and in red-green bicolor. © carnivorous--plants.com. All rights reserved.